'Marvellous Equations' Pulses With Rhythmic Power Marcia Douglas's new book imagines a resurrected Bob Marley, living in a clock tower and conversing with spirits — but Douglas also honors and elevates the voices of the women in Marley's orbit. In the anthology The Art of Friction: Where (Non)Fictions Come Together, Marcia Douglas likens the kind of writing she does to spellcasting. 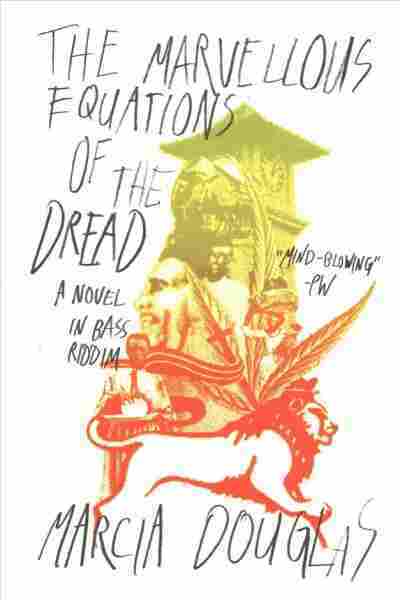 And her new book, The Marvellous Equations of the Dread: A Novel in Bass Riddim no doubt has the air of a spell. Told through chapters that are presented as musical tracks, it is a beautiful and otherworldly book; a work of poetry steeped in history and rich with imagination. The lyrical language keeps the pages turning, track after track. Douglas, who was born in the U.K. and spent her formal years in Jamaica, has a way of conveying the sense of wonder that powers the island's creative spirit. She also manages quite a feat: Weaving a complex and warmhearted tale — one told through multiple voices — against a backdrop of violence. The story centers on a reincarnated Bob Marley and ranges from the rougher parts of Kingston and Zion in Jamaica to Emperor Haile Selassie's palace in Addis Ababa. We hear first from Marley's one-time lover Leenah, a deaf but wildly perceptive woman who gives her account of the first time she and Bob met. She describes him as a man with "mischief in his eyes," "misbehaving hair," and whose cheekbones could "balance an egg or a flame or a revolution." He's a beloved figure, Bob, something between a prophet and a madman. After he dies, the people fall into an 11-day marathon of mourning. Schoolchildren, murderers, mothers, thieves, teachers, and gangsters all become enveloped in a grief the likes of which they've never known. But soon, Bob — who comes to be known as Fall-down — returns, his cancer-foot healed. This resurrected Bob is basically a vagrant, regarded by some as a fallen angel. He spits wisdom and makes his home in a clock tower in Half Way Tree in Kingston; he communicates to his people through the bass riddim of the Jamaican landscape. Douglas writes with an almost Biblical diction, her colorful prose occasionally calling to mind the surrealism of Alejandro Jodorowsky. She can be uproariously funny too — the patois practically jumps off the page, and things can go from light to dark in an instant. At one point, while walking through the streets of London, Bob wonders "where in this raasclaat place he could find a coconut water." And later: "A woman spray paints NOIZ on concrete. A baby in a trashcan sneezes." Douglas has said that as an artist, she's highly invested in what it means to be "a woman-of-words in Caribbean story space," and she is intentional about honoring and elevating her female voices. There's Leenah, but also Nanny and Anjahla, a cast of strong "sound sistren" who commune with the dead and seek to inspire the living. While Marley's presence looms and remains a force in the novel, it is these women, and Leenah in particular, who truly lead the way. As Anjahla's grandmother Sistah Vaughn puts it, "Watch out. Is woman time this." Marvellous Equations is an intoxicating mix of magical realism that not only surveys Rastafarian tradition, but also sheds light on the injustices against Rastafarians in Jamaica. As Garvey tells Bob one night just before the two erupt into a chant, "Our people are magicians." Douglas is unafraid to take chances with her characters, and this is perhaps the most striking thing about her book; all of them have distinct dialects and each one anchors the narrative without things ever getting muddled. Her chapters are tracks that all work well as singles, but when played together pulsate with great power.